Last year we (the RETROFUTURE team) visited Brunflo Kastal in Jämtland County, to take some snapshots of the battlegrounds of 1644, when a Swedish army defeated the locals under Norwegian command. Jämtland belonged to Norway back then, and plenty of wars were fought over the centuries before these crucial days when history took place in these parts. The wars were not yet over, but Jämtland became a Swedish County in 1645 and it still is to this day. 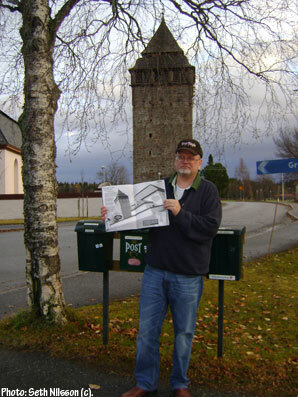 Yesterday we returned to this place and delivered 100 free copies of RETROFUTURE 6 (Western edition) – with a centre spread about the 1644 battle – to people living in this area, including the villages Hälle and Gärde that were burnt to the ground in the battle. This is all part of my current RETROFUTURE project in which about 10.000 magazines have now gone out like this around Jämtland, especially around Lake Storsjön, The Great Lake. It is a lovely project and the feedback has been very good.